The first half of our trip to Iceland was with a guided tour from Betchart Expeditions March 15-23. http://www.solareclipsetrips.com/pdf_fi ... 015_Jx.pdf. After a few days in the Reykyavik area we relocated to Akureyri in the north. This was ideal for us as we could then easily connect with Arctic Heliskiing at the end of the tour. The March 20 relocation flight detoured over the North Atlantic to intercept the solar eclipse. This eclipse was visible on land only in the Faroe Islands with notoriously bad weather, or on remote Svalbard at 78 degrees north. Flying along the eclipse path extended totality to 3 minutes 39 seconds from 2 minutes 46 seconds at a stationary point below. March 20 was one of the good weather days in Iceland, so we had great scenic views on the way out and back. Reykyavik in foreground and northwest fjords and mountains at distance. Skaftafell National Park (where we stopped briefly March 29) is in the right border area of the pic above. We were over the wing and did not see this. Due to proximity to Europe and unappealing weather on land or sea, this eclipse undoubtedly set a record for most flights. 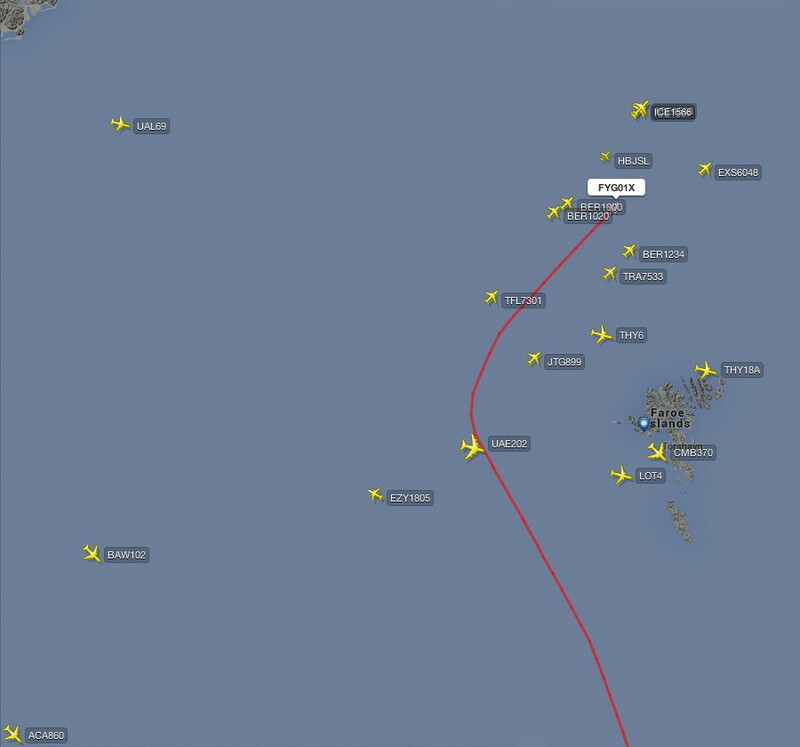 The red line is Xavier Jubier's Falcon 7X from Paris. He organized the Bermuda flight we were on in 2013. Planes on the map oriented on a SW-NE axis were charter flights to the eclipse like ours. Betchart had 3 Icelandair 757's, labeled ICE at upper right. About twelve regular commercial flights had the chance to briefly view the solar eclipse. Some of them altered their course and others even did loops to please their passengers, crew and pilots. However, it is rare that a commercial flight will promise in advance to intercept an eclipse path. Clouds on top of another volcano.